Front dust jacket flap price is “$3.95”. Back DJ flap lists five books, each followed by one review: Swimmy, Tico and the Golden Wings, Frederick, The Biggest House in the World, and The Alphabet Tree. Back dust jacket is absent the LCCN. 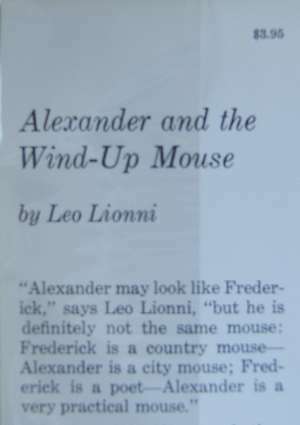 Front and back boards are red; front board has small frontal image of Alexander and Wind-Up mouse; back board is solid red.